Follow these 5 easy steps to make your poolside garden beautiful and easy to maintain. Plants and landscaping are a great way to provide privacy and protection from the sun and wind. Plants soften hard edges, fill corners and enhance the surroundings helping you create an oasis in your backyard. Without this heavy rains can wash gardens into your pool causing problems including setting you back hundreds of dollars in clean up. Placing the majority of plant life outside the fenced pool area will help limit debris and leaves falling into the pool water and stop salty pool water being splashed onto your plants and damaging them. 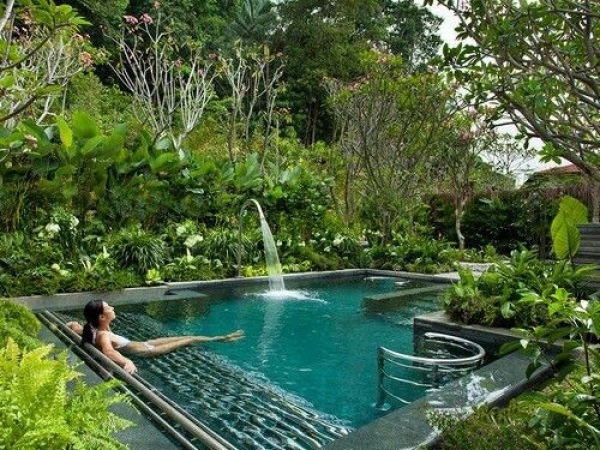 If you choose to have a garden inside your pool area choosing the right type plants is very important. Pool friendly plants must be able to thrive in semi-shade to full sunlight, tolerant of wind due to the normally exposed nature of pool areas and be able to withstand occasional salt or chlorine exposure from pool splashing. Salt-tolerant coastal species like palms, agave, bromeliads, cycads, coastal banksia, dianella, and pig face are ideal to plant near saltwater swimming pools. As a general rule of thumb, horticulturalists recommend plants with silvery, furry or waxy leaves such as bromeliads, agaves, aloe, yucca and cycads. Selecting plants with minimal leaf litter, and if possible ones without spikes, thorns or bristles, will mean less time cleaning the pool and less impact of your filtration system. The growth of invasive and potentially destructive roots systems is another aspect to consider when planning gardens and landscaping around swimming pools. Large or invasive plants can grow aggressive root systems that can crack underground filtration pipes. When considering placement of palm trees, bamboo plants, umbrella trees or any type of plant with invasive root systems, we suggest a taking a thoughtful approach. Keep in mind the placement of underground plumbing together with the proximity of plants. It is common for larger trees and plants to have roots that grow into or through underground pipes. Careful planning can limit expensive repairs such as excavation of damaged, leaking or broken pipes caused by plant growth in the future. Pollen and blossoming flowers in spring cause havoc for pool owners. While nothing can be done to prevent pollen spores and blossom filaments from blowing into your pool, regular maintenance during spring will ensure they don’t wreak too much damage on the cleaning and filtration equipment. Regularly emptying skimmer and pump baskets during periods of heavy pollen explosions and replacing broken baskets quickly will help reduce the impact this vegetation eruption can have on your pool. If your pool is surrounded by flowering plants, consider using filter sox in your skimmer basket to catch this very fine debris. A more permanent solution to a garden with flowing plants is installing a pool cover to help prevent pollen and blossom being blown into the pool during times of foliage flowering. If you’re having trouble maintaining a leafy pool or you don’t have enough time then please give us a call and book a service. 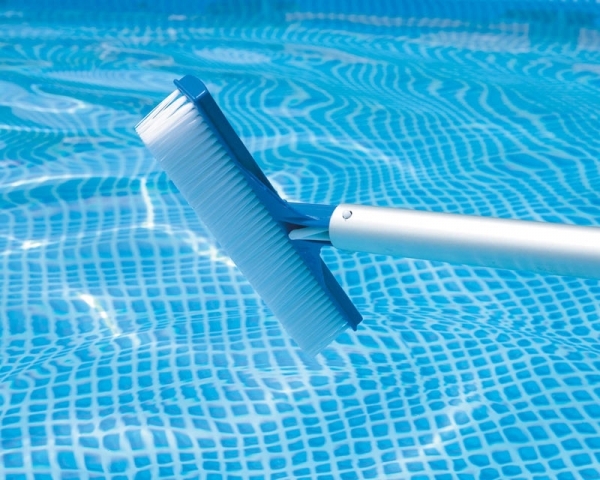 Let Pool Doctor take care of your pool, hassle free. You’ll be swimming sooner!